Wouldn’t the world be a boring place, if we had no snacks to inject some fun and excitement into our days? If you look at snacks purely from the perspective of appeasing sudden hunger pangs, then yes, an apple or a banana would serve the purpose. But, for many, especially in India, a snack served in the evening with tea adds more josh to the day and reboots our worn-out minds! When kids come back from school, they are equally eager to know what you have prepared for them. Light, cooling snacks in the summer and garam pakore in the monsoon are more than mere temptation – they are part and parcel of our lifestyle! Snacks are usually quick and easy to prepare, so that you can fix them in a jiffy even when hunger strikes without warning! They also use commonly available and seasonal ingredients – for example, in the winter when purple yam is in season, you might want to use it to make deep-fried fritters or baked snacks. Snacks need not always be deep-fried. You can also make healthy snacks using methods like baking, grilling and tava-cooking. Sometimes, a couple of healthy ingredients tossed together like a salad can make a wonderful snack. Snacks can be light or filling. In fact, some snacks are filling enough to make a light meal! So, depending on the time of the day and the purpose for making the snack, you can choose a light or a filling one. With their crispy textures and vibrant flavours, snacks are much loved by young and old alike. Appe, Dhoklas and Pakoras are evergreen traditional delicacies, which are versatile enough to be modified according to modern tastes too. 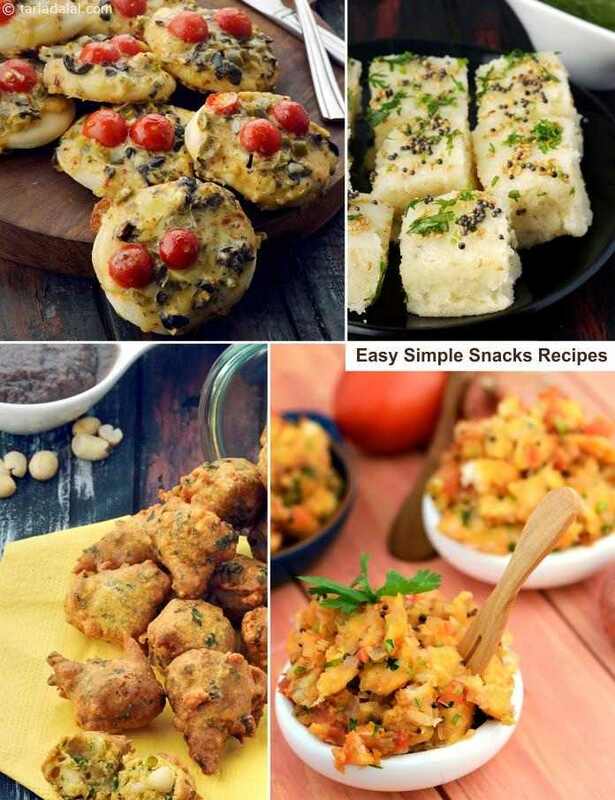 Have a go at Gobi, Palak or Bread Pakora, the Rava Dhokla, or the Quick Vegetable Appe. Grilled Broccoli and Oven Roasted Sweet Potatoes are nourishing and tasty snacks that’ll go well with everybody. When you are feeling adventurous, try something innovative like the Maggi Bhel, Instant Pav Bhaji Masala Toast or Veg Rice Cutlets. The savoury Ram Ladoo and Peanut Chaat are other popular snacks, which have a timeless appeal! If you crave for something spicy, go for the Spicy Corn Chaat, or if you wish to indulge your sweet tooth, try the Sweet Oats Chivda. Indeed, there is a snack for every requirement! Apart from the 40+ choices in this selection, there are many more waiting to be explored on our website and app, so be prepared for unending fun! 7 reasons to make Easy and Simple Snacks?